What an intriguing place.... 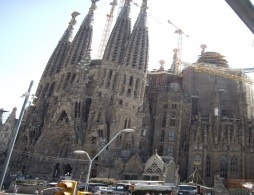 There is so much to see and experience in Barcelona you will need at least a week. The most famous street in Barcelona. 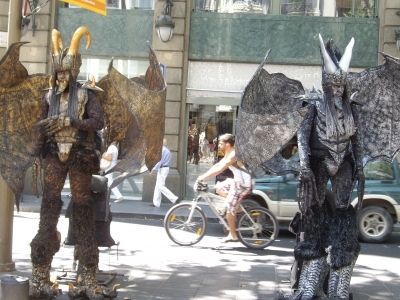 La Rambla is full of colourful street performers, flower markets, souvenier stalls and cafes. The atmosphere just walking down this street is electric and energising. Expect the unexpected. There are a few options to get around with the open top Barcelona Tour Bus hop on hop off, public transport, bikes, etc however we found one of the most fun ways to see Barcelona was the "Talking Go Car" This little yellow car/scooter seats 2 adults and is equipped with a GPS as well as a tour guide program which will direct you around the city telling you all the stories along the way. It will even tell you how to get back on track if you get lost! There are 3 guided tour routes that you can follow or you can just go off on your own stopping along the way for lunch, shopping or a stroll on the beach. We hired the "Talking Go Car" on our second day in Barcelona and this gave us a good idea of where everything was to follow up later. One of the great things about the "Talking Go Car" was theat we could park anywhere a scooter or car could park and we never had a problem (even in peak season) It's pretty important that you have good weather as it is all open. The cars are adults only (no children) and costs 99 euros for the whole day. there is also an hourly rate @ 17.50 euros per hour (always check prices as these may change) We would highly recommend this as a fun thing to do in Barcelona. Please note you MUST have an international driver's license to drive this in Barcelona. You can get an international licence from the automobile association in your state, just by filling out a form, showing your current driving licence, providing a passport photo and paying a small fee. There are hundreds of places to choose from when dining out in Barcelona but we would like to tell yu about a great find.... It was called "Happy Bar and Grill" and was at the top of La Rambla (the main street) just over the square. Address is Rambla Catalunya, 13 phone number 93 270 18 55 www.happy.es The food was great and ecellent value. They have a special 3 course menu for 10 euros. We ate there on a few occasions because it was so good. If you haven't already tried "Sangria" which is a Spanish red wine combination....you MUST try it. 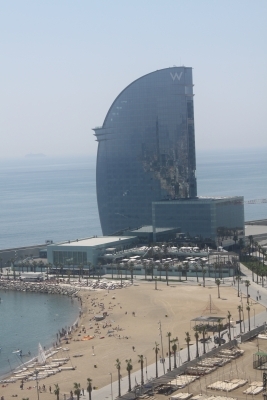 Barcelona is a huge city therefore it is important to decide in which location you would like to book your accommodation. If you want to be close to the La Rambla there are many great hotels just a few meters away however remember that La Rambla is the most prominent area for pick pockets. We stayed in the Hotel Silken, Pintor Fortuny 13 just off La Rambla. The location was excellent, central to everything that was happening. The hotel staff were very helpful and as a 4 star hotel it was overall very good value for money. 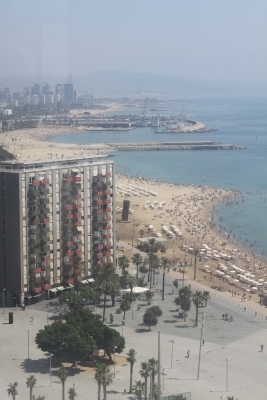 Just off the La Rambla to the right hand side when coming from the beach, is a beautiful part of the city which is the "old city" This is also a very nice area to find accommodation. Barcelona is known to be the number one destination in the world for pick pockets and hundreds of people line up to report this at the Barcelona Police Station. Be aware and do not carry large amounts of money on you. They are professional and know all the tricks. We witnessed several instances - one situation was when people were in a restaurant and as they were leaving and paying their bill a guy ran in snatched the wallet and ran out. Although he was chased by a security guard there was no way he could catch him. They were generally very tall, athletic, wear running shoes and carry nothing. If you look around you can usually spot them checking out people in the street. Crowded places are usually high target areas. I can't stress enough BE CAREFUL.